Last week I was invited by the Institute for Canadian Citizenship to participate as a Roundtable Discussion Facilitator as part of their twice-yearly Building Citizenship program at Fort York. It’s a unique initiative that deserves attention. Just prior to their Citizenship Ceremony, new Canadians are introduced to existing citizens for a welcoming discussion reflecting on what it means to be Canadian. I found the experience quite rewarding. I was born in Canada, and I take a lot of things about citizenship for granted. In this day and age, it is easy to become jaded or even wary about thoughtless patriotism. Listening to the backgrounds and stories of the new Canadians was meaningful—these are people that have, with great deliberation, chosen to make this country their home. They’ve uprooted their lives, spent years going through the process, and have fully committed themselves to becoming Canadian and part of our community. Reflecting on their journeys has given me a deeper appreciation for the simple freedoms (and responsibilities) we have in Canada. Every natural-born Canadian should witness at least one Citizenship Ceremony. It’s a solemn but joyous affair. Enjoying a thoughtful lecture by Wayne Reeves, Chief Curator of Museums and Heritage Services for the City of Toronto, on the meaning of Remembrance Day in the context of Fort York. The strength of a nation lies in its people, and I’m proud to say we became 40 stronger last week. All told, it was an excellent learning opportunity and I’m fortunate to have observed this important, intimate moment in the lives of 40 citizens. I was also pleased to see the new Fort York Visitor Centre in use—exactly the sort of community event for which it was built. My thanks to the ICC for the invitation. Photos in this post courtesy of Lambrina Nikolaou. 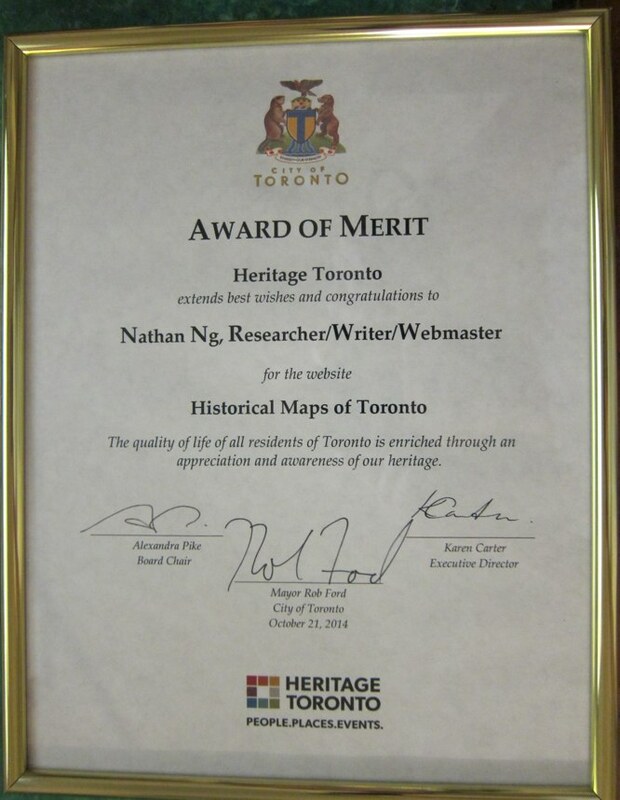 I am the delighted recipient of the 2014 Heritage Toronto Award of Merit (Media category) for my site, Historical Maps of Toronto. Gee, I’ve always wanted... Rob Ford’s signature?! 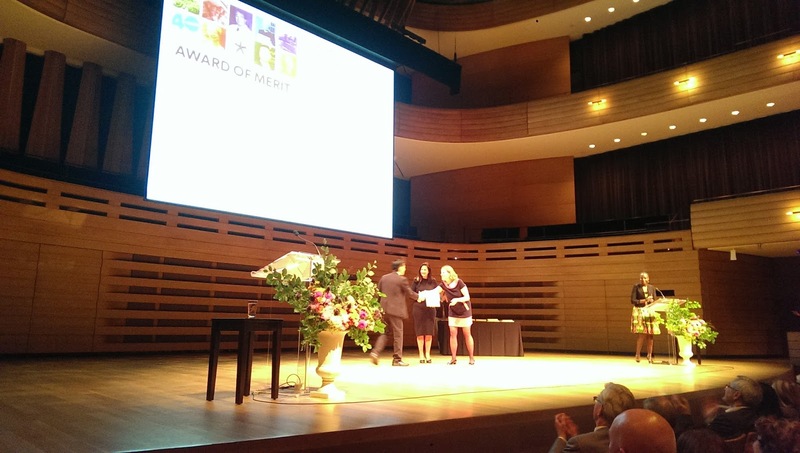 The Award was presented to me at last evening’s 40th Annual Heritage Toronto Awards at Koerner Hall. It pleases me considerably to see that Torontonians are using the site as a research resource on a regular basis. The full list of people I have to thank is extensive, but luckily I’ve already written it up (scroll down to ‘Thanks and Acknowledgments’). Carrie Martin, Elise Paradis, Stephen Otto, and anyone who ‘bought me coffee’: thank you so much for your support. Historical maps are like a series of snapshots in time. They illustrate the fascinating story of Toronto’s evolution from a compact town a little over two hundred years ago, into the bustling metropolis we know today. Rich in informative detail, yet often overlooked, they lend us a proper sense of context, and of place. They are powerful artifacts which capture Toronto’s defining tension: the ever-present impetus for change, pushing against the influence of what came before. It is my pleasure to share them with the rest of Toronto—because history belongs to all of us. If you’re into old maps or the history of early Toronto, I invite you to visit Historical Maps of Toronto, as well as its sister site Fort York and Garrison Common Maps. The Fort York Visitor Centre is about to open. It is a marvellous accomplishment. Decades (literally!) of patient, persistent work, wrangling, and planning went into making the Visitor Centre a reality. A generation of stakeholders and all levels of government have been involved. The Fort has been an oft-forgotten, sometimes neglected gem in the heart of the city, but the Visitor Centre marks an important step forward in the evolution and life of the Fort. The Visitor Centre is a clean, elegant, low-slung building that somehow manages the trick of bringing solemnity to the underside of the Gardiner Expressway. It was designed by Patkau Architects Inc. / Kearns Mancini Architects Inc. and has already won awards. I’m one of those fusty stick-in-the-mud types who are highly resistant to change, and I was anxious that the Visitor Centre might turn out to be an over-expressive architectural carbuncle drawing attention away from the actual historic site. 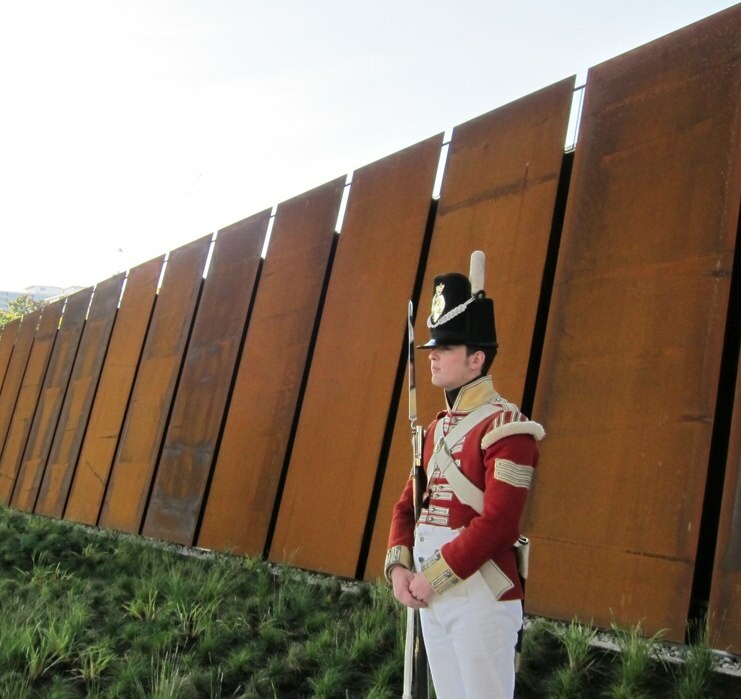 The Fort now has a world-class facility with which to welcome visitors and provide context for the history of Toronto, as well as host events and exhibits. It’s part of an overall vision that recognizes that the Fort and the accompanying Garrison Common are an integral part of the community and have a participatory role to play. Inside, the Visitor Centre seems well-laid out, and I look forward to seeing how the space is used by different exhibits. The Immersive Ramp on the upper level is particularly intriguing; I want to see how it develops. On display at the moment (in addition to materials relating to the First World War) is a donation of 11 paintings inspired by the War of 1812 by noted artist Charles Pachter (if you’ve been to College subway station, you’ve seen his handiwork). 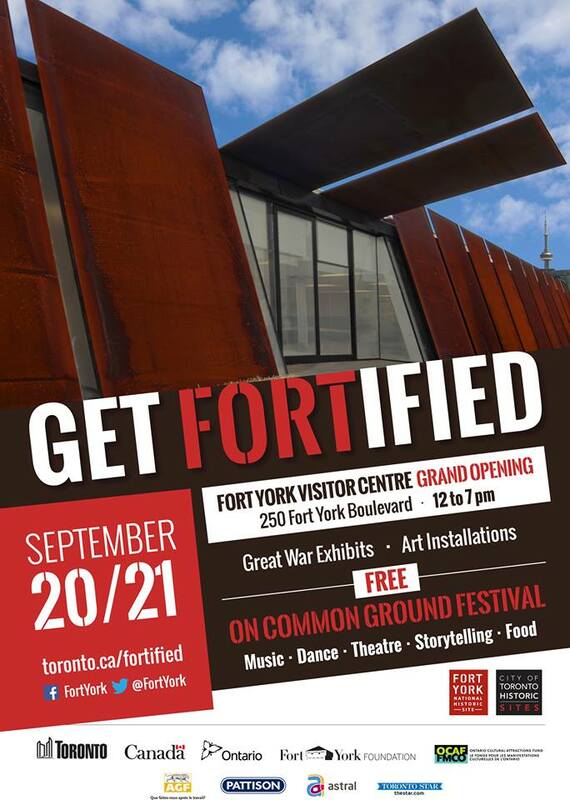 The Fort York Visitor Centre is celebrating its opening this weekend with the On Common Ground Festival. Check it out! p.s. while you’re in the neighbourhood, be sure to drop in to the recently opened 99th branch of the Toronto Public Library, the Fort York branch on Bathurst. Full disclosure: the Friends of Fort York and I collaborate together on the website, Fort York and Garrison Common Maps.